The Ontario McGuinty/Wynne Liberal governments created special legislation and regulations for industrial wind turbine owners, granting them permits to slaughter species at risk without consequences. They have license not only to kill, harm or harass a member of a species that is listed on the Species at Risk in Ontario List, but also to situate the bird-killing machines in designated Important Bird Areas—and they take full advantage. Fauna not at risk are fair game, no permit required. Wind farms are devastating populations of rare birds and bats across the world, driving some to the point of extinction. Most environmentalists just don’t want to know. Because they’re so desperate to believe in renewable energy, they’re in a state of denial. But the evidence suggests that … renewables pose a far greater threat to wildlife than climate change. A wind farm in Scotland, which the RSPB was instrumental in easing through the planning process ten years ago has successfully destroyed all but one of the forty breeding pairs of golden plover in the region. … birds are what the RSPB – originally known as the Royal Society for the Protection of Birds – was established to protect. … it appears to have decided that the “birds” in its name no longer have much relevance to its campaigning causes. In fact it appears increasingly to view their destruction with equanimity. 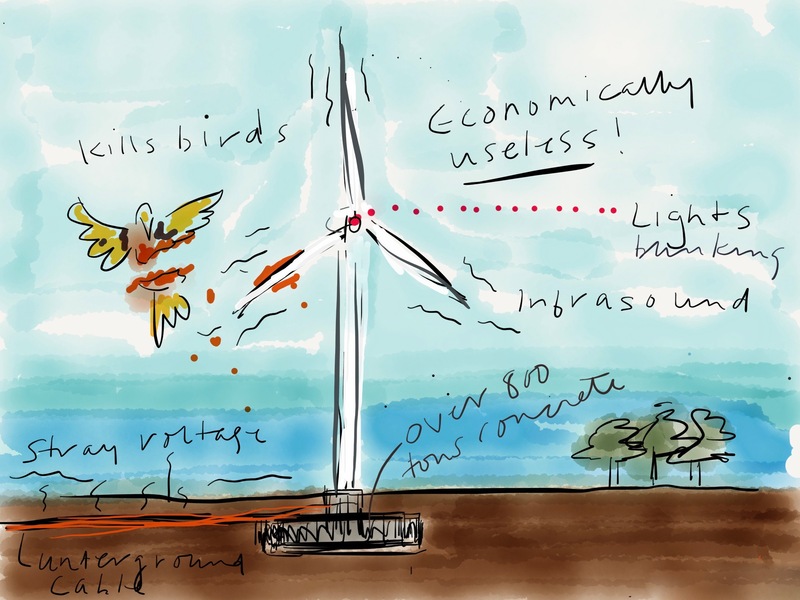 … the RSPB … made up its mind … that climate change was such an important issue that supporting renewable energy was more important than stopping birds being sliced and diced by gigantic eco-crucifixes … despite copious evidence from around the world of the millions of birds (and bats) killed by turbines each year. As usual, it’s a case of follow-the-money. As James Delingpole reported, the RSPB “is making hundreds of thousands of pounds from the wind power industry.” Bird-protection mandate and charity status obligations be damned. The wind industry worldwide is very good at hiding mortality rates, and governments and the mainstream media don’t care for the truth—it would ruin their save-the-planet-from-burning-up-with-green-technology narrative. Wildlife expert Jim Wiegand and other analysts estimated in 2013 that in the United States, the industrial wind turbines annually kill up to 39 million birds and bats, but the wind industry will never admit it. As the bird and bat mortality reports are slowly uncovered, the numbers just seem to get worse and worse. I never imagined it could get this low, but then again nobody was releasing this info to the public, so how were we to know? As she implies, real news like this is hardly ever published in the mainstream media and certainly not advertised by bird protection organizations such as Bird Studies Canada. Not surprising when you consider that Bird Studies Canada partners with the Canadian Wind Energy Association, Environment Canada and Ontario Ministry of Natural Resources to maintain the Wind Energy Bird & Bat Monitoring Database and produce the Wind Energy Bird and Bat Monitoring Database Summary of the Findings from Post-construction Monitoring Reports, dated July 2016. Of course, the Canadian Wind Energy Association, Environment Canada and Ontario Ministry of Natural Resources all have a vested interest in NOT broadcasting how many birds and bats the wind industry kills every year. That would be bad for the subsidy-sucking, taxpayer-gouging wind business, and really bad for public acceptance of government greenie, ”sustainable,” “alternative energy,“ “tackling climate change,” “decarbonizing,” “reducing carbon pollution,” “changing behaviour,” “economy and environment go together,” “saving the planet” policies. The mortality estimates presented here potentially underestimate true mortality as they are based solely on carcasses that fell within 50 m of the turbine base. …the proportion of carcasses expected to fall outside of 50 m [estimated] to be up to 51.8% of birds, based on 4 studies that searched a radius up to 85 m.
The numbers in the FOI reports that Esther obtained, while shocking, are probably just the tip of the iceberg. And just imagine the numbers world-wide! And for what are millions of birds and bats being sacrificed, with hardly a peep of protest to be heard from the many (co-opted) bird protection organizations around the world? It would be bad enough if their deaths were collateral damage for a greater good, but the terrible fact is that they are being slaughtered for nothing except a morally corrupt ideology—the massive scientific deception of manmade climate change, where the industrial wind abominations supposedly are a remedy for what is actually a non-existent problem. The killer wind machines, these fake-green, bird-and-bat-slaughtering, taxpayer-robbing, corporate-welfare, crony-capitalist monstrosities, will never meet our energy needs, will never have any redeeming value whatsoever—not for the environment, not for the economy, not for our quality of life.